Application development is expected to remain of major importance over the coming years. Using cloud-based assets for developing, testing and deploying applications has already been proven to provide significant benefits, and the paybacks are only going to increase. The following information can help you to understand why developing apps in the cloud is better than migrating apps that have been developed in a desktop integrated development environment. A recent survey found that overall development times were an average of 11.6 percent less when apps were developed in the cloud. The cloud platform is able to streamline the process by providing a centralized, comprehensive package that improves system efficiency, offers the tools and connections needed to test apps, supports mobile app development and allows developers to self-provision testing environments. Few developers today operate as individuals. Instead, they are normally part of a team. When using a desktop IDE, developers must constantly go out of the IDE to communicate with team members. In the cloud, communications can occur within the workspace, and developers can collaborate with others within their workspace. Team members can access the workspace from any location, and security permitting, they can even connect with their mobile devices. Desktop IDEs require substantial amounts of configuration management. Developers must also function as system administrators to maintain their own data centers, which can cause errors and is both time-consuming and difficult to automate with DevOps. Furthermore, when multiple computers are involved, the configurations cannot be synchronized, so tasks must be repeated on each computer. Most IDEs are disk and memory hogs. They have substantial boot times, and they can consume resources to the detriment of other applications. The result is that the developer's machine is slower, making him less productive. People no longer want comprehensive apps that do not get updated for extensive periods. Instead, they have begun to prefer apps that provide just a single utility or two with updates offered frequently. The cloud offers a way to upgrade apps efficiently and quickly and better enables process called continuious delivery software. New or small players have been handicapped by their lack of the resources available to large businesses. With cloud development, however, everyone has the ability to develop apps that are scalable, robust and filled with features. Purchasing the hardware and software needed for development and test environments can be expensive. With the cloud, the need to invest in fixed assets is reduced or eliminated. Many cloud vendors offer pay-as-you-go plans that can reduce initial investments as well. You are also spared the costs involved with migrating your app to the cloud. Cloud vendors are responsible for upgrading their platforms, and they tend to provide upgrades and new versions frequently. Instead of waiting for the latest software version to be released so that it can be installed on a desktop, developers can work with the latest version immediately and have access to newly released tools. With a cloud development environment, you will be charged for what you actually use for storage, network input/output and compute time. When demand is high, you can easily scale up, and then when demand decreases, you can scale down. With a development platform in the cloud, many of the time-consuming tasks are already done. Security, APIs, backend connections, pre-packaged functions and integrations are already waiting. Developers can build apps in less time as well as perform rapid iterations. This allows you to get your app into the hands of users in less time. Without the cloud, the typical scenario involves using a variety of different tools to monitor disconnected processes. Most cloud-based development platforms offer integrated management that spans the entire stack. You can cohesively control analytics, backend fail-safes and more. When developing in a desktop IDE, developers have little access to support. Cloud development platforms have strong communities of developers who share information and tips. Developers can find creative ways to solve problems or develop workarounds. 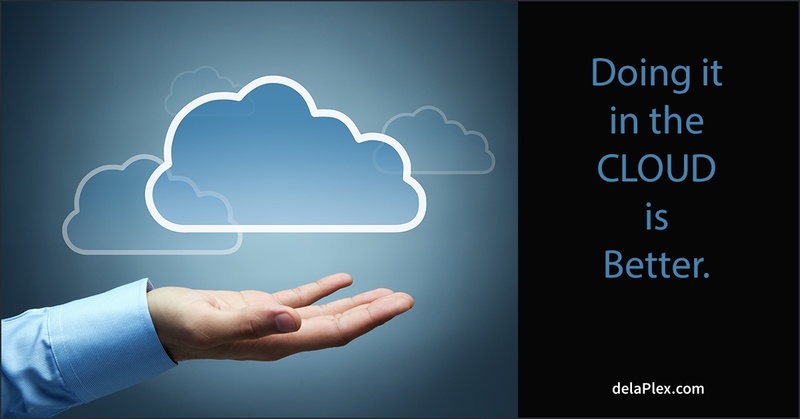 Cloud development is especially suitable for outsourced software development. Regardless of where team members are located, they can collaborate on the project. Theoretically, a project could be divided into small pieces, and developers in countries around the world could each work on their own piece individually, resulting in work that progresses 24/7. Modifications can be made in minutes or hours instead of days, keeping the project moving forward and speeding iterations. Developing apps in the cloud can save you time and money. You will be able to get your apps to market sooner and at a lower cost, and you will be able to perform upgrades more efficiently. The cloud offers greater agility and flexibility, the ability to scale as needed and opportunities that could be difficult or impossible to leverage in a physical environment. The solution architects at delaPlex Software are prepared to help you plan and execute your transition to the cloud, enabling you to take full advantage of the benefits that each platform provides. Click below to read more specific details about Microsoft Azure or Amazon Web Services. We base our success on helping our clients become more successful, and we are always focused on ways to give our clients the most value. Our dedicated, talented team members will take the time to understand your business and your specific needs. Contact us today to learn more about how we work and how we can help you achieve your goals.